Before his 2010 death, Lou Cameron was the author of over 300 genre novels. He was a post-war pulpster who specialized in tawdry action stories with tightly-wound plots. Think 'Longarm'. Think 'Renegade'. Lou Cameron knew his way around a standard story arc. This fact is what makes Cameron’s 1960 debut novel, “Angel’s Flight”, such a delightful curiosity. Although it was released as a Gold Medal crime novel - and was recently re-released by Black Gat Books - the story captures the tone and scope of literary fiction. 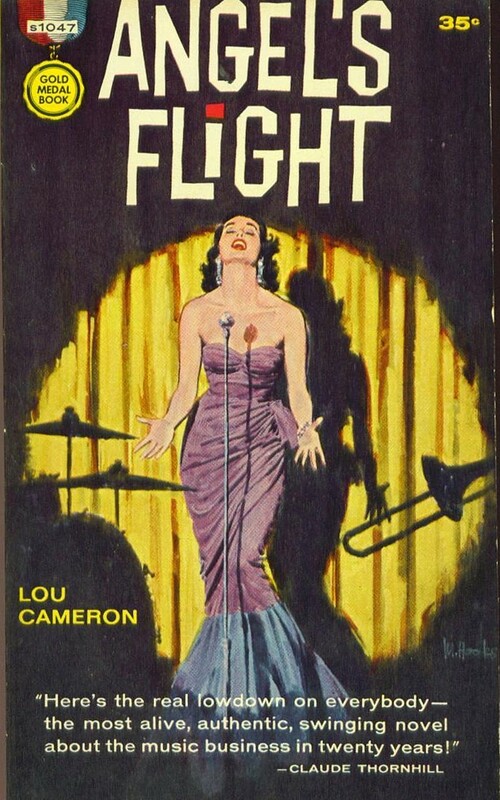 Yes, it seems Lou Cameron started out aspiring to be serious author writing a serious book. And it worked. Although “Angel’s Flight” is a lean 233 pages, the story spans about 17 years time between 1939 and 1956 - from the jazzy Great Depression to the dawn of rock-n-roll. Our guide through this era is our narrator, an honest and earnest journeyman jazzman named Ben Parker. Ben’s narration is written in a be-bop jazz lingo that was later adopted by James Ellroy in “American Tabloid” and “The Cold Six Thousand”. The prose sings throughout the readable novel. Parker’s foil is the vapid and conniving fellow jazzman, Johnny Angel, whose ambition for success well outpaces his musical talent. Like many of the colorful characters in Parker’s life, Angel comes and goes. He starts out as an irritant and evolves into an existential threat. Angel’s Flight is a real masterpiece of storytelling that holds your attention even though there isn’t much of a standard story arc. It feels like the literary equivalent of a Martin Scorsese movie - like “Goodfellas” or “Wolf of Wall Street” - that tracks a single character through the ups and downs of a remarkable life. This storytelling approach is surprising coming from Lou Cameron, whose body of work relied on an economical approach to plotting. Cameron’s knack for creating colorful characters is on high-display, and readers will come to adore Ben Parker and the women and friends who float in and out of his life. Although the novel has murders, mafia, payola and betrayals, it’s doesn’t feel like a normal Gold Medal crime novel. It feels more weighty and significant - like a story of the jazz age that needed to be preserved because it captured an important era in America’s cultural history. To that end, Black Gat Books has done America a real favor by preserving this piece of important art.